Some smells bring back memories. In that way, strawberries are like summer. There’s a sweet smell that feels the air and regardless of what’s being made in the kitchen, adding strawberries makes it sweet and summer-like. Many fruits can be that way. Funny thing about strawberries — they aren’t fruit. They’re part of a flower, the receptacle of the flower of the plant to be exact. Bright, red and delicious, strawberries have a very long history of over 2,200 years. They were found in Italy as far back as 234 B.C. In the 18th century, people in Argentina feared strawberries were poisonous. Early settlers in Massachusetts, on the other hand, grew fond of strawberries grown by local American Indians. Strawberries are readily available in California, which is home to over to over 23,000 square acres of the plant. If all the strawberries produced in California in a single year were laid berry to berry, it would wrap around the world 15 times. California produces over 1 billion pounds of strawberries annually. But California is not the only place where strawberries are grown. Strawberries are grown in every state in America and all providences in Canada. While eating the naturally sweet treat, point out to your little one some unique traits about strawberries like it’s the only fruit with seeds on the outside. 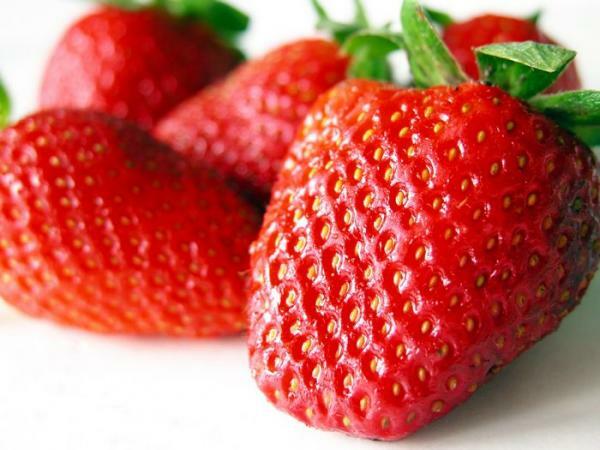 On average, a single strawberry has 200 seeds. Including fruit into the diet of you and your children can be as simple as offering snacks or as a healthy addition to nearly all desserts. Making those desserts does not need to be time consuming! Twist the classic bruschetta with fruit, courtesy of allrecipes.com. 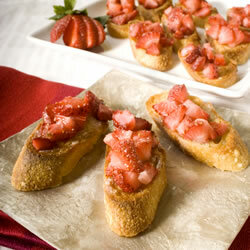 You’ll need a baguette of choice, 1 tablespoon of butter softened, 2 cups of chopped strawberries and ¼ cup of sugar. Cut the baguette into slices. Preheat the oven to broil. Spread a thin layer of butter on each side of the bread. Arrange the bread slices in a single layer on a large baking pan. Place the bread in the oven for 1 to 2 minutes, until lightly toasted. Spoon some chopped strawberries onto each piece of toast; then sprinkle sugar over the strawberries. Place under the broiler again until caramelized, 3 to 5 minutes. Serve right away.